This summer’s devastating floods near the Dollar Ridge Fire resulted from a combination of a) flash floods and b) a previous wildfire “burn scar” in northern Utah. Debris flows resulted from extreme rainfall directly over the area of limited, burned out vegetation. Duchesne County Sheriff’s Deputies, County Road Department workers and firefighters assigned to the area helped at least 50 people who found themselves trapped by fast-moving water and debris. Many homeowners are still cleaning up the mess left behind. Flash floods are the #1 weather-related killer in the U.S. according to the National Weather Service; the geography and topology of Utah make floods very difficult to forecast. Mapping out potential flood-risk areas is tricky since debris flows and flood paths are so unpredictable. What factors affect flood damage? Rainfall is the most important factor in creating a flood, but many other factors contribute to the resulting damage. Some rainfall is ‘captured’ by soil and vegetation, and the remainder enters waterways as flow. The surrounding vegetation in and around the river and any structures in and adjacent to the waterway all affect the potential to flood. The time of the rain is another factor. If a large storm is following a wet period, the ground does not have the capacity to absorb as much moisture. Be aware of new construction uphill and upstream from your home. The flood patterns can easily be changed and increase the flow down your street and into your home. As our neighbors experienced, floods can carry large debris such as boulders and cause structural damage. Floods can also leave behind large amounts of silt and difficult to clean debris. However, the problems may be more long-term. Entire rooms, vehicles, and any other property that came in contact with flood waters may not be salvageable. Submerged vehicles usually have irreparable water damage to the engine and other critical components. 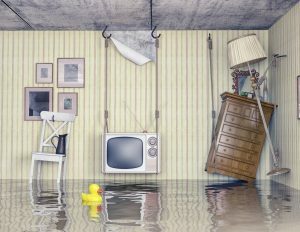 Flooded homes can develop mold problems weeks or months later. The best advice is — purchase flood insurance. You must take an extra step above normal coverage and obtain a separate policy. A typical homeowners policy specifically EXCLUDES floods; a flood is not covered under any normal insurance policy. And a ‘flood’ can be caused by an ocean, a river, or a lake but also be moisture of a spring thaw or run-off from the parking lot up the hill; your agent will explain the limitations of a standard policy. We can’t control rain but we can do a few things to lessen our chances of expensive flood damage. Learn the flood alert signals of your community. Keep sandbags on hand to help divert unusually high water away from your foundation. In snowy climates, mark the drains to avoid piling snow on top of them. Even have ready emergency building materials if you live in a flood-prone area like plywood, plastic sheeting, lumber, nails, shovels, and sandbags. In St. George, Ally1 Disaster Solutions is the team to call for experienced flood damage cleanup. Ally1 Disaster Solutions will use state-of-the-art equipment while the claim specialists work directly with your insurance company. Locally owned, with 20 years of experience in the industry, they are Southern Utah’s most experienced and trusted restoration professionals available 24/7 at (435) 238-4852 or ally1disastersolutions.com. © Copyright 2017 Restoration Service Southern Utah - Ally1. All Rights Reserved. Powered by Spot On Solutions.